Is this the back of the new iPhone? These could be the backplates for the upcoming model of iPhone. And if they are, then a lot of the rumours we've reported look like they're on the money. The images were picked up by 9to5mac and claim to be the chassis of the sixth generation iPhone. The black plate itself appears to be mainly metal – possibly a nod back to the likes of the original iPhone, but there's a strip of potentially glass at the top and the bottom. This inclusion of metal on the back of the iPhone 5 could be to accommodate NFC technology, which may struggle to make its way through the glass frame found on the 4S. The smaller dock connector that's had a lot of column inches is present and correct, and the headphone jack has been moved from the top corner of the device to the bottom corner, a la iPod Touch. We could also be in for beefier speakers on the iPhone 5, seeing as the speaker grills has been redesigned. There's also a new hole between the camera lens and LED flash. It's not clear what this is, but it could be a new home for the second microphone, used for capturing audio while videoing. The latest image leaks also reveal that the iPhone 5 is set to keep the physical home button – with Apple not fully embracing its multi-touch gesture controls just yet. 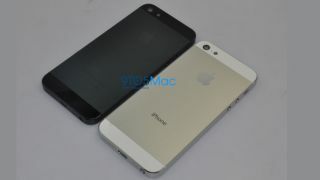 The images indicate the iPhone 5 will be the same width as the iPhone 4S, it will be longer, meaning a bigger screen. We're expecting somewhere around 4-inches, so still not coming close to the 4.8-inch display on the Samsung Galaxy S3. The backplate was offered up by iPhone repair experts iFixyouri. It was the first company to confirm that the iPad would come in white, so these could well be the real thing. If these backplates are genuine, it'll be welcome additions for the new iPhone, though nothing earth-shattering. We expect the iPhone 5 to land sometime around October, hopefully packing the next iteration of Apple's mobile platform, iOS 6. Keep up to date will all the news in our iPhone 5 release date, news and rumours article and check out the video round up below.